You are at:Home»Life Issues & Bioethics»Contraception & Abortion»Abortion and Ireland: Are the Irish Copping Out? For the Catholic Church and the pro-life movement, Ireland’s steadfast preserving of its laws defending the rights of the unborn has been a beacon of hope in Europe. Ireland has continued to hold the highest birth rate of other country in the European Union, and is one of the very few European countries whose population has maintained continual growth. Statistical evidence explaining this fact points directly towards the Irish government’s stance on abortion, as Ireland has remained one of only two states in the European Union which currently has banned abortions. A recent movement in Ireland has brought this ban into serious debate. 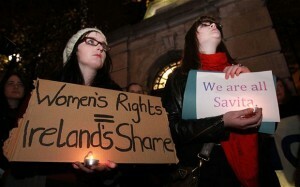 The death of a 31 year-old, Indian born woman named Savita Halappanavar on October 28, 2012 has triggered a very emotional movement within Ireland. The cause of the Halappanavar’ s death was determined to be blood poisoning from a miscarriage; a result which doctors claim could have been prevented if Halappanavar had not been refused abortion. In response to the steadily growing national and international outcry concerning the death of Halappanavar, the Irish government has resolved to make some serious legal changes. In 1992, Ireland’s Supreme Court decided that abortion would be permitted in the extreme case where there existed “a real and substantial risk to the life of the mother.” Despite the Supreme Court’s ruling, however, this decision was never officially written into law. Now, in light of the recent protests taking place both in Dublin as well as well as in other European countries, the Irish government has decided to take the country’s first real steps toward changing its anti-abortion ban. Not only has the Irish government firmly resolved to clarify the exception regarding the physical safety of the mother, Irish government officials have begun to more seriously consider giving into the demands of its population, the requests of its neighbors, and the attacks from international pro-choice organizations, to modify the abortion ban further. The week of January 8th began a series of important meetings of the Irish government’s Health Council committee to discuss the legal and moral ramifications of altering or removing Ireland’s current abortion ban. The three day parliamentary discussion panel took place in Dublin. For a country whose population has been famous for being dominantly Catholic, it seems logical that the current debate in Ireland should be resolved fairly easily, especially considering how straightforward the Church has been in regards to the maintaining of Ireland’s current laws protecting the unborn. Unfortunately, many believe that Ireland’s Catholic background has, in recent decades, become more of a cultural tradition rather than a religious one, a consequence due in no small part to the continual rise of secularism in Europe. Like the Israelites in the Old Testament whose faith in their God had become weak and who began to long to live in the hedonistic lifestyles of their neighbors, many people of Ireland find themselves losing the faith in their Catholic beliefs and are being seduced by the attractiveness of ‘reproductive freedoms’ which are in place in other countries. The question which now remains is this: How far are the people of Ireland willing to go from here? Most likely, these first steps which the Irish government is planning on taking towards changing Ireland’s current laws will lead to more. Once the first concession is made, it will become all the easier to make more concessions. It is a slippery slope which in the end will lead to yet another western country which will legally allow the murder of a human being. Will abortion lead to more domestic violence, fewer workers, and an older population for the Irish people, a trend which has become increasingly problematic in other European countries? Will Ireland will join the rest of the members of the European Union, save Malta, in a slow, cultural suicide as its birth rate drops below that which is necessary to support a population? If abortion were to become legal in Ireland, will the Irish people begin to disappear? Such a sad picture deserves time for thought and prayer. I challenge you on your information. What I read said that she had e. Coli, which would not have been helped or hindered by an abortion. If this is true, please amend your post, as it could be very misleading on an already contentious topic. Frankly, I have read several different opinions (many claiming to be professional) about the real cause of her death. I have found biased and exaggerated information from those who want Ireland’s laws to change, and potentially skewed information from those who don’t want them to change. What I have stated as the cause of death is what I found to be the most common and unbiased of opinions. To be honest however, whether or not she died from being refused abortion is a moot point. There are large numbers of people in Ireland who are so emotionally driven by what has happened that facts won’t necessarily make a difference at this point, especially since the government has firmly decided to at least alter its current laws. My point in this article is mainly that the Irish people should return to their faith otherwise it will be impossible to overcome the culture of death which is seeping into their society.